Showing results for tags 'battletome'. Hey Guys! Felt creative, so I decided to write up my interpretation of the "Shadow Aelfs" that've been rumoured for so long. Will come up with units and rules and so on at some point. This was partially inspired by Melcauvc's amazing work on the Firebellies and Ironweld. ------------- A dark fog descends over the battlefield. The soldiers are suddenly gripped with an ineffable sense of dread. They look around, uncertain of what this strange phenomenon is. Dark shadows dart through it, as a strange and unearthly giggling can be heard. And then, as if out of nowhere, a legion of terrible Aelves bursts from the fog. Massive Draconian figures slash and tear savagely, tentacled monstrosities lumber around, cruelly gobbling up any stragglers. Shadow Daemons frolic through the gore, chirping half-truths and attacking the defenseless, over the loud prayers of armoured Aelves to their dread God. And just like that, they disappear back into the fog. Ulgu is a cruel and deceitful realm. Every being is out for itself, for no weakness can be tolerated in a realm where danger can lurk around any corner. Only the most cut-throat of creatures can survive. The realm is like this partially due to its inherent nature (Shadows are untrustworthy things), but the biggest source of its pro find duplicity is none other than it's ruler; Malerion. Malerion is an entity as old as Sigmar and the Everchosen themselves, and was once an Aelf named Malekith. He was a great and powerful Witch King in the World-That-Was, and was bound to the sorcery of Ulgu. This meant that when it was destroyed, his essence survived well into the Age of Myth, when he resurfaced under his new name. He was initially little more than shadowy mist, but from the sheer amount of spite his withered soul carried, he manifested in a new and terrible form. It was not long before he began to explore the realm, and he would soon find his mother and old enemy, Morathi, who was too changed. They fought briefly, before settling on a truce. They took joint control of the realm, for they knew that one would never be willingly ruled by the other, and joined Sigmar's growing pantheon. It was around this time that the two joined Tyrion and Teclis in locating the Aelf souls, for they too desired fellows of their race to rule. Once they found out that Slaanesh had consumed all the Aelf souls, Malerion is said to have entered a rage so great and palpable that it manifested in the form of a fog of mystery that would always accompany his chosen. They captured Slaanesh, and each took their share of souls. Malerion, instead of choosing the last to be devoured like Teclis, or the most honourable like Tyrion, Malerion took the most deceitful and cruel Alef souls that dwelled within the Dark Prince. These were the murderers and slavers, and they were incidentally the last souls available. The Gods went their separate ways, but Malerion was bitter. He felt shortchanged, for he was effectively given the scum of their race. The spite that he carried for Tyrion and Teclis all the way from the World-That-Was had abruptly resurfaced, and he would have his vengeance on the two for being so arrogant. He retreated to his dark tower in the center of the realm, and began to experiment upon the souls. Using fell magics, he brought forth the inner evil within them, turning them into horrific scaled things that barely resembled an Aelf. These beings were the first Druuchior, which can mean both "Unknown" and "Unnatural" in Aelvish. These creatures, despite backstabbing each other at every twist and turn, managed to establish a crude civilisation. They were Malerion's answer to Tyrion's heavenly and "pure" creations, and he was determined that one day he would use them to get his revenge. When the Age of Chaos began, they were relatively unharmed, due to Ulgu's very nature helping to repel the invaders. However, some Chaotic Corruption did indeed begin to take root by the time the Age of Sigmar came around. Again, they did very little except build in strength and numbers. Little more changed until the Necroquake, when Nagash began his assault. They realised that with such a large amount of raw magic and instability, now would be a perfect time to reveal themselves, and to finally unveil the terrible truth of what lurked in the shadows. ------------ So when thinking of this faction, I thought of a few key themes/ideas: MONSTER HEAVY: With Ulgu being such a mysterious realm, it would only make sense to take advantage of the numerous gribblies hiding in the shadows, such as the Shadow Daemons mentioned in the DoK Battletome, plus the Druuchori themselves being so monstrous. THE EVERMIST: To represent the most that accompanies them all the time, they could have something like the "Forgotten Nightmares" rule the Deepkin have, or something as simple as -1 to hit for ranged weapons. SPELLHEAVY: Since the Aelves are such a magic-focused race, and Malerion was once the Witch King, it would only make sense that they have a lot of Wizards, mainly with spells about trickery and deception. MALERION: The big scaly M himself would obviously be a big centrepiece model If there's any ideas or feedback you have, I'd be happy to hear! It's no secret that the Stormcast, being the poster boys (& gals) of AoS receive frequent updates. Especially because the central narrative often involves them directly. We are experiencing a bit of a renaissance with GW. Updates are coming more quickly and new or updated factions are dripping with lore and interesting rules that are improving the health of the gaming community. At the time of this writing Gloomspite Gitz dropped a month ago and the new Skaven and Flesh Eater Courts Battletomes are a week away from release with regular drips of information coming in from the community site. A common refrain from both myself and other Stormcast players within our community is that the Stormcast lack a kind of internal balance. We have many options to choose from but in many cases our synergies can be clunky leaving little room for diverse army build, we usually end up having to exploit a select few units to compete. Our most recent update with the Sacrosanct Chamber brought us several new tools that have begun to dominate Stormcast lists. In particular we have the Celestar Ballista , Sequitors and Evocators. At first these were described as borderline game breaking. I think as we have come to see Stormcast are not cleaning up the tournament scene and the output/ of these units you are seeing are being matched by new releases in other armies and they are starting to look more inline with the new meta power-levels. DoK and LoN are seeing armies close the gap with their own power level but this is not to say that those factions don't need a few adjustments. If you look at the damage; even battleline units in GG, FEC and Skaven armies are going to be putting out with minimal buffing we are going to see the superiority of Sequitors and Evocators mellow out which I think is a good thing for the community. What interests me more than anything though is the prospect of loving my army composition and rules interactions. Currently I think the Stormcast have rigid and clunky interactions/ synergies barring a few exceptions which consequently are taken in most lists. Consider that Zombie Dragons are going to be conditional Battleline choices in FEC armies and Skaven will not have to lock itself into one clan to have units benefit from clan keywords. 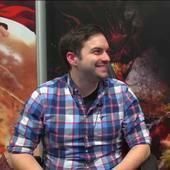 These are exciting changes that allow more fluidity to building armies. We may see the Stardrake come into it's own outside of being a massive reactive roadblock, it could very well let us finally take Dracothian Guard units as battleline choices and hopefully they will be appropriately costed going forward. In additon, we may be allowed to gain Stormhost benefits that do not force us to handicap ourselves with poor command traits and bad (usually our only) artefacts. It's an exciting time and though it may be a year or two before our next update I think the Stormcast could very likely become a more fluid and "healthily" synergistic army where both our opponents and ourselves enjoy a dynamic tactical experience. Hey there fellow Acolytes, figured I might as well do some posts relating to the rules spoilers we will be getting leading up to the battletome. To preface this, it's important to acknowledge all rules we are shown are in a vacuum, we have no idea what other changes may be coming that supplement or affect these rules. But that being said, let's dive straight into it. Kicking off strong. Now "Overwhelming Mass" is exactly the sort of thing I expected with a new Skaven book, it both rewards and strongly pushes taking large unit sizes, which often with Pestilens I wasn't wont to do due to it potentially setting up a bad battleshock. THAT BEING SAID, I think it is extremely, EXTREMELY unlikely the Plague Monk warscroll hasn't had more than a few changed to accommodate this rule. "Strength in Numbers" is also here making a return. I've sung this one's praises in previous blog posts before, it's neat it's clean and it does exactly what you need it to do. Glad you're still here with us buddy. Well well well. "Lead From the Back" is one hell of a rule. Sylvaneth Superstar Lee who I play regularly has started making a habit of shooting his allied Deepkin eels across the table at me and assassinating Priests / heavily damaging Furnaces, and this will provide some insurance against that. It also helps to negate the drawback of the Priests needing to be right in the thick of it with their 13" range prayers. "Scurry Away" is neat as hell. If the enemy doesn't activate into it in time, the Plague Priests and Plague Furnaces can just LEAVE the combat instead of fighting. If the Verminlords get this I'll be shocked, but if they do I'll be a very happy man. This one is a spell for Grey Seers specifically, but it's not far fetched to imagine we will be making a greater use of those under the new ruleset. "Splinter" is funny as hell, you can either use it to casually remove that Daemon Icon Bearer and prevent them from cheesing their way through the battleshock phase, or you can shoot for the moon and try get that cheeky 3+ and knock off a Blood Knight. It's neat and has decent enough utility. On top of all this there were a few little hints scattered throughout the article. "Pestilens players will find their allegiance abilities familiar" implies the return of Echoes of the Great Plagues, but given they gave us 4 other allegiance rules I wouldn't be surprised for it to be a little diminished. The confirmation that every clan has Command Traits and Artefacts means there's a good chance our existing ones have been reworked somewhat to accommodate the new rules. I imagine we'll have a few days of Flesh Eater Courts spoilers (boo, hiss, who cares) interspersed between glorious Skaven rule releases, so i'll check back in a few days when we have more info. As always, leave your thoughts below. Hi, after GW will bring the Trollking as Order on Demand, I made a little fun und put the warscrolls of Troggoths and Gargants (including forgeworld and some noneexistent warscrolls) together als a Fanmade Monsters of Destruction Battletome (it's a pdf on my google drive). Like in my other cases I have some problems making Allegiance Abilities for them, but if they don't have there own they can still use the Destruction Allegiance Abilities. Do you have some feedback or other ideas? Hello all! If you've been paying attention to total war news like I have, then you know about the vampire coast dlc coming out. The lore for the faction was amazing, and I figured that they would fit into AOS pretty well with some changes, So thats what I plan on doing! Hi everyone, I recently reread the Dreadfleet Novella set in the Old World, I really enjoyed the twist at the end involving one of the characters, The Golden Magus. Since the book ended on such a cliffhanger and The End Times happened, we sadly did not get to see more of him. So I have decided to create a new battle-tome/faction involving the magus and the forces of the Galleons Graveyard. Im looking for those people who are willing to help with unit ideas, lore, and artwork. well then lets get sailing on the high seas! The Furnace Kings are an elite faction of Ogor smiths. Originally hailing from Chamon, the Furnace Kings are the servants of the Suneater; harnessing his gift of fire in order to forge mighty weapons and warmachines in the name of GorkaMorka. Led by the fearsome Forge Mongers, ancient smiths whose bulk is more muscle then fat, the Furnace Kings hordes are equipped to spread the might of their god throughout all the realms! Is the Hosts of Slaanesh army in another book or something, because they don’t seem to have their own Battletome. It’s confusing because they’re a fairly large army. I was thinking about making a Host of Slaanesh army, but I can’t find a book about them. There have been quite a few 'fan-made battletome' ideas circulating at the moment, and I though it would be good to flesh out current ideas and create new ones. So far @Melcavuk and @AthlorianStoners are the main players, and a link to there threads are here: So far there are the Suneater Tribes and Fellwater Kingdoms, both from destruction. I am considering applying for the GW conceptualiser post that just opened up (I think), and as such I thought up of a few ideas for Death, mainly focusing on the mortal followers of Nagash. There's also a lot of scope regarding the Battletome: Chaos Undivided. To look at a basis, @Mengel Miniatures 's Tomb Kings battletome was incredible, as was @Bueno beastmen and Wolves of Ghur battletomes. So, any ideas, please tell! What with Legions of Nagash being more-or-less an allegiance wide battletome, what say you about a similar treatment being possible for Destruction? We already have tomes for a few factions, but goblins are feeling noticeably left out at present, and a book with allegiance abilities for a themed "Gordrakks Great WAAAGH" army would revitalise the left-behind factions and provide some newer and more interesting allegiance abilities tailored to each race. Sneaky for grots, smashy for orruks and chompy/stompy for ogors. Of course this is likely wishful thinking, but an ogor warlord can dream about things other than meat right? Hi there, I prefer the Hardback Editions of the Battletome, but I don't really get behind Games Workshops Strategy on publishing Battletomes as Hardbacks, Softbacks or both. My general impression is: When a new Battletome is published, it is pbulished as Hardback and Softback or Hardback only. Then after a while, Games Workshops stop selling (and probably reprinting) the Hardback Editions of the Battletome and only sells the Softback Edition. Although some Battletomes seem to be available als Hardbacks forever (Seraphon and Fyreslayers). Now I have two questions: Is that true? Have all Battletomes previously been published as Hardbacks? (Read: Is there hope to get them via ebay?) Is that documented somewhere public, which Battletomes were published as Hard- or Softbacks? Thanks a lot!  Welcome to the new home of Battletome: The End Times. Rather than build a blog or other ways, I figured that using The Grand Alliance as the hub for my hosting and posting about BT: ET would work out best for everyone. Thanks to Ben for creating a site where I can easily host the files for everyone to find! What is Battletome: The End Times? It's a fan-made conversion of the original End Times scenarios. Like many, I was pretty hyped up about the End Times. Unfortunately, my gaming group lacked a lot of the key players, and I had none. So I never got to play them! When AoS arrived, I decided that the game was so well suited to scenarios that converting them would be easy enough. I want to play out the end of my favorite fantasy setting! Thus was born this massive tome. It is faction neutral, for the moment. Meaning you can use whatever army you have, without penalties. It also includes a number of Times of War, so you can play and feel truly in the setting. Current progress report: Version 1.0 is finished! All battleplans, Time of War rules, deployment maps and other things are finished. The Battletome: The End Times is done. Enjoy! Fluff/extras for battleplans: Nagash Glottkin Khaine Thanquol Archaon Beneath you'll find each download as they are available. The full Battletome: The End Times is considered the master version. Each sub-tome contains only the parts that the original book contained, so you may have to download others to use the relevant Time of War rules. The new and final version of Battletome: The End Times is finished! There's so much I could say about this. And I will update the blog later. But for now, here's the links to the tome and ALL its parts. I also made a trailer, so please enjoy that! That's all of them! As a bonus, here's a screensaver! It's just a silly little thing, but I figured that since I have the files it'd be fun. Thanks for reading! Mighty Battles is a campaign system for two players, designed to be played across a single day, weekend or a couple of club nights. If you've ever played a campaign that just died a slow death, you know how frustrating that can be. Mighty Battles is here to allow you and an opponent to string your battles together in a simple structure, add some narrative details, and finish the story in a reasonable amount of time! 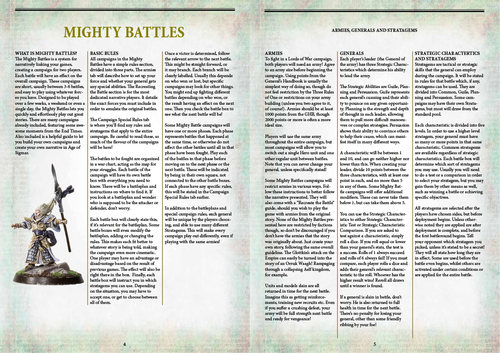 Included is a guide on how to design your own Mighty Battles campaigns. All 5 End Times campaigns are also packaged in, giving you plenty of content right off the bat! 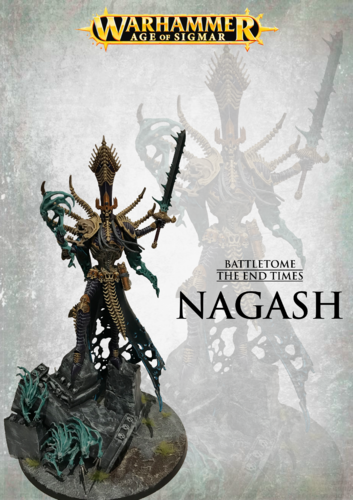 Battletome: Nagash was the first of the End Times campaign books. It follows the story of his resurrection all the way until he crushes the kingdom of Nehekhara. This is the longest tome in the project, featuring 21 battleplans. It also includes the two Times of War "Haunted Battlegrounds" and "Darkest Depths" as well as the Mighty Battles campaign "The Rise of Nagash". 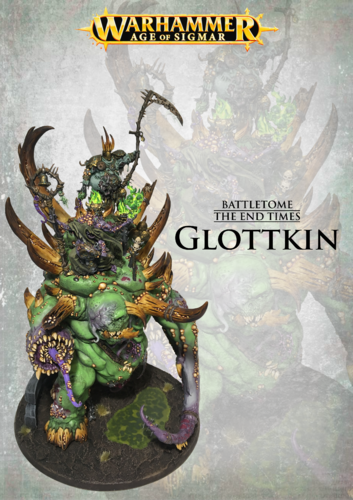 Battletome: Glottkin is part 2 of the End Times books. This is the original appearance of the Glottkin, a trio who would return again and again to plague the Mortal Realms. Where Nagash focused on the Undead, this tome is set squarely in the Empire, with Karl Franz taking center stage. Among the shorter tomes, it contains 6 battleplans for your to play. In addition, it has the "Chaos Ascendant" and "Streets of Death" Time of War rules and the "Conquest of the Tentacle Lord" Mighty Battles campaign. 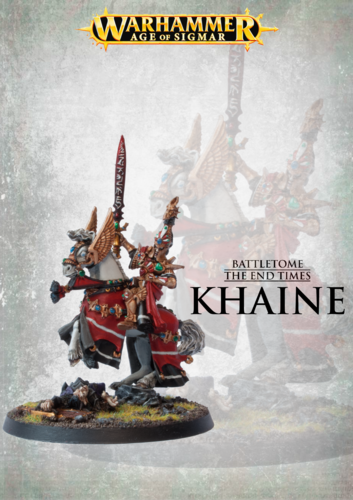 Khaine is the third part of the End Times saga. This was the turning points in more ways than one, as the massive conflict between the High Elves and Dark Elves was resolved, and the enigmatic Wood Elves were brought back into the fold. This is another shorter battletome with another 7 battleplans. It contains a single Time of War, "The Great Vortex Weakens" and a Mighty Battles campaign, "The Return". This is the fourth tome in the End Times series of campaign books. The Skaven unleash their endless hordes, and the empires of Dwarfs and Lizardmen fall. There would be no coming back from this. Here you will find 6 battleplans detailing the fall of Lizardmen and Dwarfs, as well as Thanquol's shining moment! The Time of War "Realms of the Lizardmen" is also included, as is the Mighty Battles campaign "The Doom of Belegar". This is the final tome in the collection. 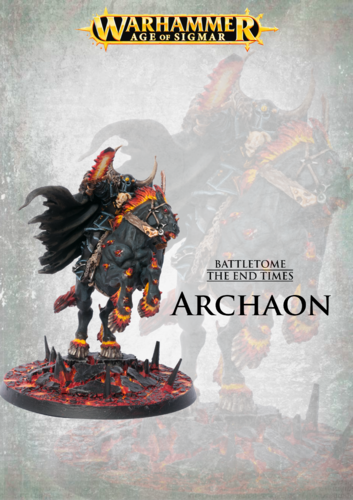 Battletome: Archaon covers the final moments of the World-That-Was. This is really where the whole sage ends. Archaon the Everchosen shows why he's called Lord of the End Times. It contains no Time of War rules, but compensates with 11 battleplans, many of them quite complex. It also has a Mighty Battles campaign, "Plague and Death", no points for guessing who's involved in that! Hey everyone, This is my first post in this forum I think. I earlier registered here but never visited again after that. But after all the leaks of the GHB2017I thought this might be a good place to discuss this topic, because for me this is very important. I startet playing Ogre Kingdoms with Warhammer Fantasy and was super excited that the Gutbusters found their way to the Age of Sigmar. I got even more excited after the release of the Beastclaw Raiders Book. I read a lot about the lore and found out that sometimes the Beastclaw and Gutbuster tribes meet each other to share their meals together. But after I had seen the leaks of the new GHB2017 I got really sad, because there was nothing in it for a Gutbusters player like me. As GW talked about the new Handbook they said that they wanted to update the factions, which got left behind. I also hoped after I had seen the newest "army books" that I would see a lot of different spells for Destruction wizards. Something like different spells for Butchers, Waaaagh! magic for Weirdnobs etc. After I had seen the leaks about points I think Gutbusters are in a pretty bad state at the moment. Especially because the old "Destruction Allegiance abilites" got nerfed very hard. I can see where these nerfs are coming from. But now as a Gutbusters player I only seem as allies of Beastclaw Raiders. My deepest dream would have come true if they had gotten extra allegiance abilites, spells and command traits. Another thing I have never understood is why Maneaters and Firebellies are seperate factions. I also had hoped that Maneaters would get a price reduction. I would say they are definitely weaker than Ironguts, but cost more. I think they are beautiful miniatures but I can't see them in a game, because they are not worth the price. Why don't summarize them all under "Gutbusters" Allegiance? I had hoped that GW seperated these factions from each other, because they wanted to expand on them later. But at the moment I have the feeling that GW isn't interested in investing in Ogors anymore. I found the idea of an Ogor Alliance extremely unique for a fantasy game. There are no other game systems where Ogres have an own organized faction. This is what made AoS and Warhammer Fantasy unique for me. But at the moment as a Gutbusters player i feel really left behind, especially because I had hoped that in the new GHB2017 there would be some ogor love. Maybe GW is working on a new Gutbusters book right at the moment. But for me it doesn't look that way. What do you think about the state of the Gutbusters? 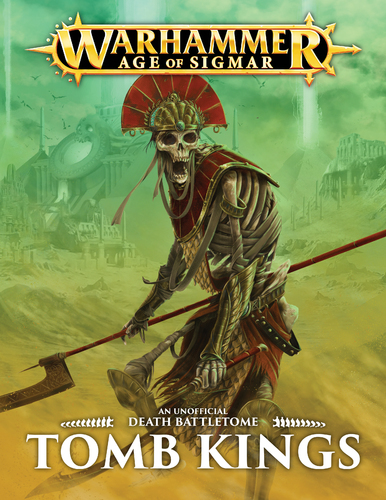 This is the Unofficial Tomb Kings Battletome for Age of Sigmar. With 114 pages of content including: • 58 pages of new lore and artwork for the Tomb Kings within the Mortal Realms • New Allegiance Abilities, Command Traits, Artifacts, and a Spell Lore • Time of War rules and a Battleplan • 9 New Warscroll Battalions • 4 New Warscroll units including the Hierotitan and Necrolith Colossus You can read my thoughts on the creation of this Battletome over the past year on Mengel Miniatures.